Bari Airport, unlike other airports in Italy, is not served by a direct railway line. Nonetheless, Bari has an elaborate bus network to facilitate travel to Bari City and to other locations surrounding the airport. The AMTAB buses are a favorite for the locals because they are cheap. They are designated as urban bus service number 16 and they make trips from the airport to the Piazza Aldo Moro which is by the Bari Centrale, Bari’s central railway station. The trip takes 40 to 60 minutes; tickets cost €0.80 but they have to be utilized within 75 minutes. Another bus service but which is more expensive than the AMTAB is the Tempesta Shuttle Bus. Its services run directly from the airport to the railway station with its designated stop being at the Piazza Aldo Moro. Tempesta buses are loved for their speedy service; the trip takes 20 to 30 minutes and it costs €4.15. You will find both AMTAB and Tempesta buses right outside the terminal building and there are big display signs have been used to pinpoint this location. Unlike the AMTAB and other bus companies in Bari that require bus tickets, with Tempesta you can always pay the driver directly. 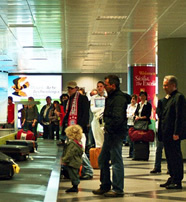 For your guided traveling requirements there are plenty taxis outside the arrivals area. As expected, they are expensive compared to the buses but carry the advantage that you can haul in some heavy luggage with you. The taxi trip to Bari takes roughly 25 minutes and will cost you €20. Not all taxis are what they claim to be; some may quote very cheap fares only for the cost to increase upon arrival at your destination. Taxis from reputable companies are usually white or yellow and have the taxi sign on their roofs in addition to an identification number on the driver’s door. 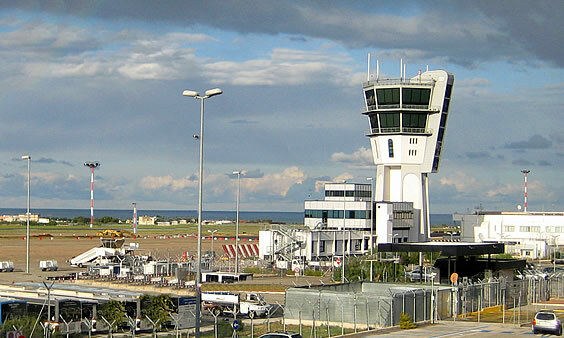 Some of the recommended taxis at Bari Airport are the Taxi Apulia, Radiotaxi and EuroTaxi. Travelers are advised to ensure that the taxi’s meter is working and if not so negotiate the price before boarding it. Apart from the charges reflected by the meter expect to pay an additional sum for late night, weekend and public holiday travel, luggage, airport fees, and being in the company of more than four passengers. For travel convenience that is ultimately cheaper than taxis for an extended Bari stay, car hire services are the best. You can always get one at the arrivals terminal although many travelers make pre travel arrangements with these car hire companies via their websites. Some of the companies available include Maggiore, Win Rent, Auto Europa, Avis, Hertz, Locauto and Thrifty. Car hires are mostly advised for people well versed with Italy’s traffic and roads system. Driving around the city can be hectic especially on the narrow and confusing roads. It is much easier to drive in the city’s outskirts though. Car rental companies have a good variety of vehicles especially for family travelers. Equipment such as luggage racks, baby safety seats and GPS navigation are readily available. Some companies have special cars for disabled drivers while others can assist visually-impaired travelers if they have drivers with a valid license. The age limit to hire a car is 21 years plus you should have a valid driving license. Even so, persons between ages 21 and 25 are obligated to pay a “young driver’s surcharge”. Moreover, they may not be able to hire certain cars such as specialty cars, convertibles and larger vehicles. Drivers are always requested to have their seat belts on at all times, to obey speed limits, and not to drink and drive. There several comparison sites online to help you choose the most affordable company for your unique transport needs.